This line with a selection station of coils is used for leveling and feeding of metal to another machine (e.g. plasma SprintCutter). Uncoiling machine MasterCoil is designed for reeling out sheet coil material. A frame is a support for two ball-bearings located to the left and to the right and put onto a hollow shaft journal. The RotoForming machine is designed to perform such operations as edge folding and flanging in sheet metal parts to be connected. Machine for cutting pipes (from 10 to 500 mm length) from stainless/ galvanized steel with thicknesses up to 1.0 mm and Ø from 80 to 630 mm. 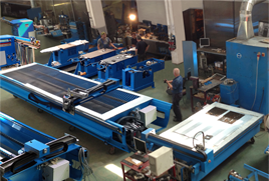 AROT increases production capacity and automatizes the spiral tubes production process. Horizontal decoiler Pallet HD is used to feed strips to spiral-wound machine but unlike vertical decoilers, Palette HD can hold up to 4 rolls of metal simultaneously.